After entering the gate and passing the tropical flowering gardens, you will make your way down imported Jerusalem limestone path to the great room of the house. The valted ceilings of the room give the living, dining and kitchen an open and very caribbean feel and it will quickly become the heart of your stay as the perfect gathering and entertaining spot for your group. A large deck opens to the spectacular view of Hurrican Hole. Two master bedrooms flank this great room on either side assuring privacy, each with their own private balcony. Two more bedrooms are one level down with both private outdoor sitting areas as well as a shared outdoor space. 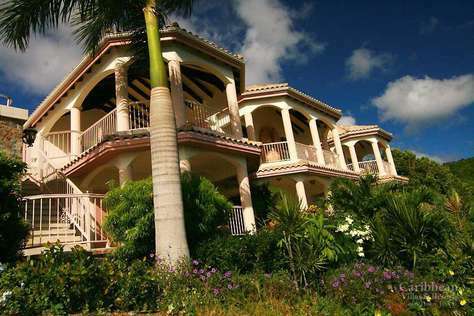 At the south end of the home, nesteled in more tropical gardens, is your own pool and sundeck.